More Presenter Spots Now Open! please watch these videos and read the details below! This is another video for the parents! This is the first video kids see when they log into thier video vault account! It goes over the 8 traits of a True Magician while teaching the 3 Rules of Magic! At Discover Magic we create High quality magic tricks with a purpose. 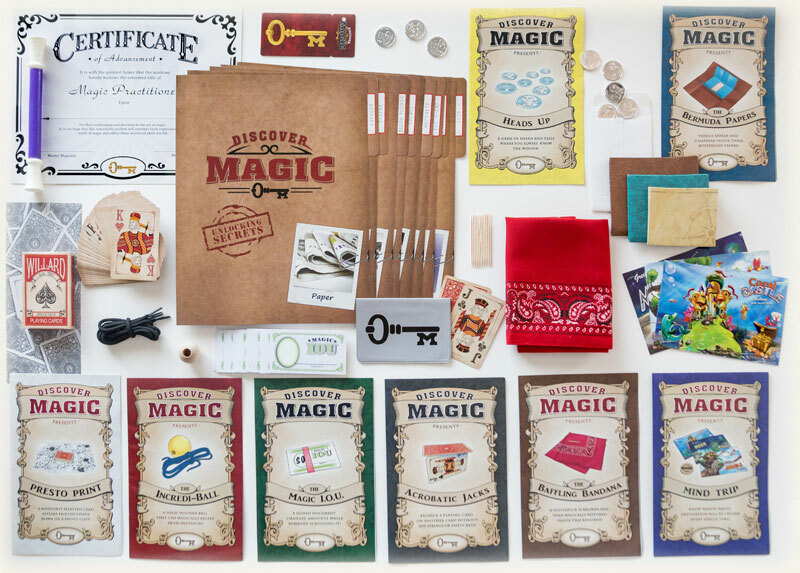 Discover Magic leverages the power and excitement of learning magic secrets to get kids to put down their electronic devices and learn important social skills like using people's names and looking others in the eyes. We live in an “ask Siri” world of instant downloads, fast food, and selfies. And you may have noticed that people are less and less patient, less prepared, and less thoughtful of others than ever before. Kids are spending more and more time looking DOWN at "smart" devices, creating anxiety and depression at unprecedented rates. Discover Magic is a magic course you can teach in your area to build your brand, create an additional revenue stream and do something good for the next generation of children. Discover Magic is designed to be flexible to fit your needs. During the school year you can teach it as an after-school program for a full week or one day a week for multiple weeks. You can run the program in the summer as a camp as your own program or team up with a local program that is already established. You can get sponsors or grants so you can teach it to Boys and Girls programs or you can even teach it at nursing homes. You can teach the classes or you can hire others to teach the classes. We have designed this so that you can do what you enjoy most! We curently have 3 courses (Purple Wand, Green Wand and Orange Wand! (this is so your students can keep coming back) In addition to that, we have 3 single day programs that you can use to promote and fill your full class. These single day programs can be done as workshops or as school assembly shows and for each program we offer Discover Magic branded top secret file folders that to go with each show and are perfect for parents to see the quality of what they would receive when coming to one of your full courses. We also provide optional Stand-alone tricks, Discover Magic branded activity books and other items you can use as back of room sales, as incentives for enrolling in classes, or as giveaways to promote your brand! On the first day of class your students will get a custom trick, a top secret file folder, and special key card to access the online video vault. That key card has a single use access code on it so they can set up a password and then log in on any computer or device they wish. Once logged in, secret words found in the file folders after each lesson will unlock more and more videos – including the special in-class videos that teach the 8 traits and bonus videos covering additional tricks that you may not have had time to cover in class. At the end of each course students get a special Discover Magic graduation wand and certificate of advancement. Discover Magic is filled with surprises. The tricks are custom designed for Discover Magic including custom coins and cards with hidden secrets in them. Much less than you would think considering how much you get! Contact Brian for more details. What does a presenter get? You will receive a presenters manual with over 100 pages of valuable content, an online presenters account, access to our group discussions, promotional materials, continued training. PLUS, you will also receive all the materials you need for a class of 20 students. Once I am a presenter, what will I do next? Once your license is approved you can start laying the groundwork for your first class. - Find out what successful programs in your area charge to determine what you can charge. - Find a place that is centrally located and easy-to-find to conduct your classes. - Determine what format your classes will follow, and then pick the dates for your classes to take place. - Use promotional material we will provide to let your community know about your upcoming classes. - Begin taking deposits and making reservations for spaces in your class. How do I find a place to conduct classes in my community? As part of your training you will be given lots of ideas on where to conduct classes and how to promote them. But the library is a great place to start. Libraries are always looking for ways to increase traffic and awareness in their community, so it could be a win-win situation! Check your local area for Dance or Ballet Lessons for children to see where they meet. Frequently, these spacious rooms are only occupied during specific times. A lot of towns have JCC's, YMCA's and Community Centers that might have rooms available. Schools, Boys and Girls clubs, even assisted living centers (yep some will let you use there meeting space in exchange for a show at the end of the program. How will I find my first class full of students? Most parents are actively looking for quality programs for their children. We will provide you with press releases and other marketing materials. Also, almost every community has an online presence that promotes local activities, so we'll help you arrange to have your classes come up any time a parent searches the local community for something to do. Beyond those methods for getting the word out, there is your own performance power. Maybe offer a free performance for a local Elementary School for the chance to promote your classes, or the local Country Club or Sunday School groups. Any 'Free' performance that results in several children signing up may actually be worth $1,000 or more! But your best bet for filling a class fast is offering a substantial discount for your inaugural class. – set the price at $295 and offer your first class a special $195 offer, for example. Can I have an exclusive market? Yes, you can. We want you to have every opportunity to succeed. When you buy a DM license you are not guaranteed an exclusive market – but you can earn one or even multiple exclusive markets by meeting certain volume requirements for that city. How will your website send students to my class? Once you become a Licensed Presenter of Discover Magic, you and your city will be listed on our site, along with a link for getting directly in touch with you regarding classes in your area. Otherwise, your marketing materials should tell people how to contact you directly along with information about the website. What equipment, if any, will I need to have the best class possible? Each class will have some video content for the students to watch, so you\'ll need some way to project video onto a screen for the entire class at certain times. Most meeting rooms are able to provide a screen as well as a projector that can be hooked up to a computer, which will probably make your life a bit easier. Of course, not everybody has that, in which case, you would need a projector strong enough for a decent sized screen in fairly full light, as well as something to play the videos and of course, a screen or a nice white wall. There are also smaller TV/DVD combos that are portable and easy to use as well. What, exactly, should I be looking for in a class room? You will need enough space to spread your class out a bit at times, so if you plan on having 24 students, you will need more room than it would take to simply place 24 chairs there. There are times when students are spread around the room in pairs with some space between them, so make sure you have plenty of space. Tables are helpful but not mandatory. And do not forget locations with projectors and screens already accessible are ideal. What is the ideal class size? We recommend 12 to 16 students for an ideal learning environment. However, if you should happen to end up with 40 or 50 students signing up for the same classes, even if you have 2 or 3 assistants to help out, I would recommend breaking that into two or three smaller classes. That way, if any one of those 40 /50 students can't make it to one class or another, he/she would have a second chance to experience the same material by going with the other group. As far as minimums are concerned, each presenter might draw the line in a different place, but I typically have a minimum of 6 people for a class. But you are welcome to use DM to teach private lessons as well – it is up to you. Right away - As soon as you receive your manual, you will want to give yourself enough time to read through the materials and plan on a month or two to get all your ducks in a row and to pick a good time and location for your class and give parents time to sign up. But in the end the time line is up to you – materials are ready to ship now!! !